The Presidential Council's Interior Ministry said it had arrested a person who used to appear in videos threatening to attack Mitiga prison run by Tripoli Special Deterrence Force (SDF) and free ISIS militants and other extremists detained in it. Interior Minister Fathi Bashagha told all security apparatuses that Abdelsalam Shughib had been arrested and was under interrogation at the Public Prosecutor's Office. "We will bring down all those who are part of terrorist groups and we will prevail security and prohibit the use of violence so that all people across Libya are safe and secure." The statement reads, saying it is ready to cooperate with all neighboring countries and friend ones to fight terrorism and cross border crime. Days ago, the ministry said it had apprehended ISIS militants who infiltrated into Tripoli to carry out terrorist attacks in Tripoli and its suburbs. The spokesman for the Presidential Council's government Muhannad Younis denied Saturday any negotiations with Abdelrazik Al-Nathori or any other figures from Khalifa Haftar's forces. The spokesman reaffirmed that the Libyan Army forces under Presidential Council's command are continuing to foil the attack of Haftar's forces on Tripoli. The statement denied news circulated on social media about negotiations between Libyan Army forces and Haftar's forces Chief of Staff Al-Nathori about a ceasefire in Tripoli. In the meantime, the Head of Presidential Council Fayez Al-Sarraj called for a UN Security Council fact-finding mission in Tripoli to document violations by Haftar's attacking forces, including supplying Haftar's forces with weapons. Al-Sarraj accused Haftar's forces of using foreign aircraft to strike Tripoli, based on Ahmed Al-Mismari's statement on last Thursday, when he said "friend aircraft" had helped them in airstrikes. Sources in Tunisia said that the Tunisian Foreign Ministry prevented the foreign minister of the east-based interim government in Libya; loyal to Haftar, from holding a press conference in Tunis yesterday, underlining that it does not recognize any other government in Libya than the government in Tripoli. The east-based interim government announced in a statement yesterday the postponement of a press conference in Tunis to give a brief on the latest developments on the ground in Libya. A member of the Libyan internationally recognised government forces fires during fighting with Eastern forces in Ain Zara, Tripoli, Libya April 20, 2019. In the past the United Arab Emirates and Egypt have supported Haftar with air strikes during campaigns to take eastern Libya. Both countries flew air strikes on Tripoli in 2014 during a different conflict to help a Haftar-allied force, US officials said at the time. Both sides claimed progress in southern Tripoli yesterday, but no more details were immediately available. On Friday, two children were killed in shelling in southern Tripoli, residents said. Member of the High Council of State (HCS) Abdul Rahman Al-Shater said that warlord Khalifa Haftar's demonstration of power by using foreign aircraft to seize power in Libya is treason against the nation that rejects autocracy. "The will of the Libyan people will prevail in the end and Haftar will be labelled as a traitor," Al-Shater tweeted. He stressed that the countries supporting him are making the mistake of their lives in terms of relations between states, accusing Saudi Arabia of exporting terrorist ideology and political money to create chaos in Libya. He also accused the UAE of conspiring against Libya, under the pretext of fighting terrorism, while its warplanes are taking the lives of civilians, all over the Libyan territory, as he put it. The Tunisian Foreign Ministry disclosed Saturday that it is making arrangements to convene a meeting of foreign ministers of Tunisia, Algeria, and Egypt in Tunis to coordinate the efforts of the three countries with the aim of ending the tension in Libya and resuming political talks. "The Minister of Foreign Affairs, Khemaies Jhinaoui is continuing contacts and consultations with various regional and international parties to hasten the end of military confrontations in Libya," Tunisian Foreign Ministry said in an official communiqué. Massive amounts of dust are reportedly expected over Europe in the coming days, with Malta being amongst the countries to be impacted. Dusty skies are projected on Sunday over parts of Spain, France, Switzerland, southern Italy, Malta and islands in the western Mediterranean, according to the weather monitoring website severe-weather.eu. 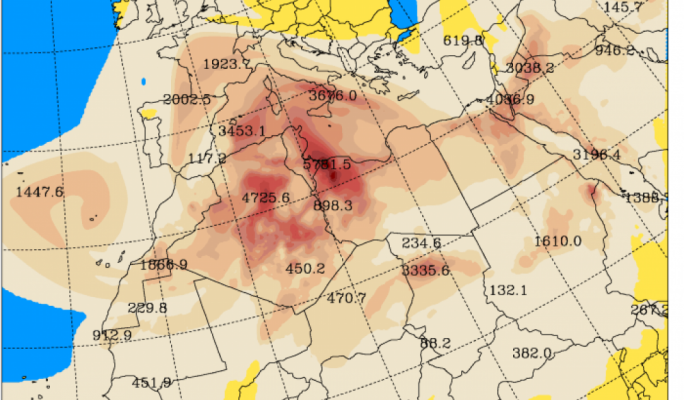 The dust is caused by a broad cutoff upper low over the Iberian peninsula and the western Mediterranean, it said, with low, strong southerly winds pushing massive amounts of Saharan dust - mainly from Algeria - northwards. Winds are expected to reach force 7. Temperatures for Easter Sunday should hit a high of 19°C, which will drop to 14°C by the end of the day. The Libyan civilian aviation authority has closed Tripoli's Mitiga Airport amid residents' reports of an airstrike on the city. Citing security reasons, Mitiga Airport said on its website on Sunday that the Libyan civilian aviation authority had closed the airport's air space until further notice. The spokesman of the Libyan National Army (LNA), Ahmed Mismari, said late on Saturday that heavy fighting, involving aviation, was underway in the vicinity of Tripoli. © AP Photo / Manu Brabo UN Security Council Calls for Urgent Resolution on Libya – German Envoy"The authorities have closed the airspace above the airport over security concerns, until further notice," the Mitiga International Airport wrote on Facebook. LNA Commander Khalifa Haftar ordered on April 4 an offensive to retake Tripoli from the GNA forces, referring to the need to clear the city of terrorist forces. Haftar doesn't recognize Libya's United Nations-backed GNA government and instead backs a rival administration in eastern Libya. Explosions shook the Libyan capital Tripoli late on Saturday after an air strike, residents said and Reuters reported. Read more: Libya's battle for Tripoli — what you need to knowWatch video 01:45 Share Libya: fighting forces thousands to flee Tripoli Send Facebook google+ Whatsapp Tumblr linkedin stumble Digg reddit Newsvine Permalink https://p.dw.com/p/3H6m0 Libya: fighting forces thousands to flee Tripoli"New offensive"We have launched a new phase of attack. The LNA, for its part, said its fighters were "taking control of several new positions on the front lines in Tripoli." Haftar's offensive has revealed contrasting positions towards Libya, with the United States and Russia, for once, on the same side. The Head of the Presidential Council Fayez Al-Sarraj has called on the Libyan Army forces under his command to adhere to International Humanitarian Law (IHL) and human rights as they fight off Khalifa Haftar's forces on the outskirts of Tripoli. The Libyan Army forces under Al-Sarraj's command said Saturday that they started a counteroffensive against Haftar's forces in all frontlines, with fierce clashes in Wadi Rabea, Airport Road, Ain Zara and Khalit Al-Furjan. The spokesman for the media office of the Volcano of Rage Operation Mustafa Al-Majye said Saturday that their forces had started attacking Haftar's forces and had seized many locations. Locations seized on Saturday from Haftar's forces include Al-Tuaisha, Wadi Rabea and Ain Zara with news saying Libyan Army forces are hours away from fully seizing Qasir Benghashir, which was used by Haftar's forces for Grad launchers to attack civilians in residential areas over the last few days. 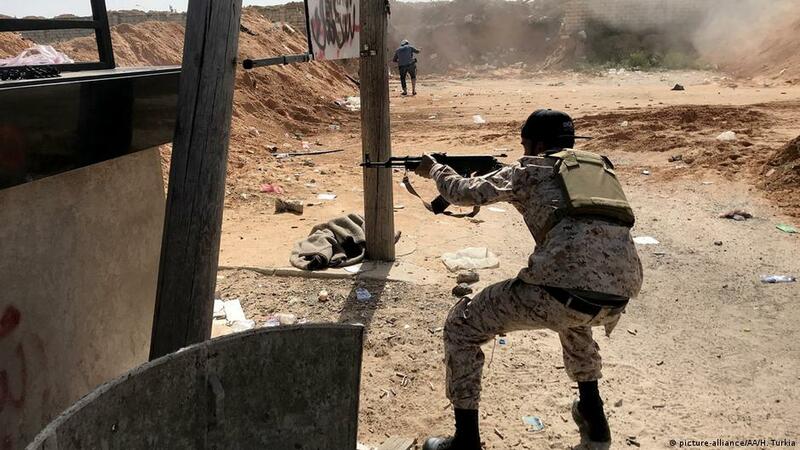 In the meantime, the Libyan Army said Saturday's clashes are the most violent since day one of the attack as they managed to secure more areas around Tripoli and start the counteroffensive. The UN envoy to Libya Ghassan Salame hailed Saturday the keenness of Libyans to hold municipal elections despite the current conflict in the country. On Twitter, Salame said that seven municipalities hold today elections and he hails their persistence for taking part in them. Brak Al-Shati, Edri Al-Shati, Al-Rahibat, Ubari, Al-Garda Al-Shati, Al-Shwairif, and Zelton all held municipal elections on Saturday. The Central Commission of Municipal Councils Elections (CCMCE) tweeted that the voters were received starting 9.00 AM and would at 6.00 PM local time, saying the time could be extended for two more hours if the turnout was more than expected. CCMCE held municipal elections in 9 municipalities in southern and western Libya in late March, hoping to hold elections in 68 municipalities this year. The former Italian Interior Minister Marco Minitti said Khalifa Haftar's attack on Tripoli will have long term consequences, not only in Libya but also in Italy. Minitti told an Italian newspaper Friday that the consequences include the influx of illegal immigrants, which are real and cannot be resolved by shutting ports but should be solved in Libya. Minitti said Libya is the scene for international tensions at the moment as when Haftar's forces started the attack, US forces left Tripoli, adding that Haftar then went to Moscow. "There's also a big gap amid the players in the Libyan status quo with Turkey and Qatar on one hand, and UAE, Egypt and Saudi Arabia on the other." He referred to Italy as choosing a political isolation by using illegal immigration as conflict point with the rest of Europe. Libyan protesters attend a demonstration to demand an end to the Khalifa Haftar’s offensive against Tripoli, in Martyrs’ Square in central Tripoli,Libya April 19, 2019. — Reuters picTRIPOLI, April 20 — Heavy clashes broke out in the southern districts of the Libyan capital Tripoli on Saturday, with shelling audible in the city centre, residents said, as the death toll from two weeks of fighting between the country’s rival governments rose to 220. Despite the offensive, Haftar’s Libya National Army (LNA) force has not been able to breach the southern defences of forces allied to the internationally recognized administration based in the city. Both sides claimed progress in southern Tripoli, but no more details were immediately available. Yesterday, two children were killed in shelling in southern Tripoli, residents said.